Denham said that as the crime occurred, one employee ran out the front of the business to where his parents were parked to pick him up. Upon hearing of the robbery, the employee’s father grabbed a .45 caliber pistol, confronted Hicks behind the building, then shot him multiple time [as he attempted to escape]. The legality of shooting at someone running away depends on the circumstances and the jurisdiction. Texas, for example, has special provisions if a theft occurs at night on your own property, where a reasonable person would believe that shooting the thief was necessary to prevent the loss of movable property. In most states, you are within your rights to use deadly force if someone’s in the process of kidnapping an innocent. Generally speaking, if a bad guy has moved far enough away that they’re no longer a threat, shooting at them is a bad idea. If you’re in a densely populated area, you might hit, injure or kill an innocent bystander. But there’s another situation where juries and prosecutors usually agree that shooting a fleeing perp is reasonable: where the the armed defender has been threatened with a weapon that’s effective at a distance. Such as a gun. A good guy with a gun cannot know if a bad guy who’s threatened them with a gun who’s moving away is retreating or making a tactical move to get to cover or a better position from which to shoot. It’s not uncommon for criminals to fire backwards toward pursuers, to cover their escape. They are still a deadly threat. We do not know how the prosecutor in this case will rule. Anniston is a town of about 23,000, home to the Anniston Army Depot, which employs 3,400 people. I doubt that the man with the .45 will be charged. I can see a lot of “scenarios” where shooting a “fleeing” suspect is justified. The most notable one is if the gun the robber had, was pointed at me, even if he was moving away. Seems like a good shoot, Id be interested in an update. Legal niceties aside, getting shot was a risk the perp was running and I for one care not a whit for him. Amen- if you rob a person/place and present any weapon when doing so, even if you are running away, there should be no civil or legal penalty against anyone for shooting you. In hell holes like NY, the thief could probably sue you for shooting him. Exactly, this isn’t tag. You don’t get to just run to home base after shoving a gun in my face. As long as the robber is moving freely and armed they are a lethal threat. There was a study that examined the time a person could turn, compared to the others reaction time to fire. The finding was that a person could fire, then turn to run, in the time the other could react and fire themselves. The result was a shot in the back. Shooter will get a medal in Alabama. As it should be. This was in Alabama, not Massachusetts. In many states attempted arson of a building, particularly an inhabited building, is valid justification for using deadly force (shooting). YMMV by state. If you have a gun and are in the commission or escaping from a violent crime (i.e. a robbery) you are a deadly threat, period. Action beats reaction. The lesson is, don’t go robbing people. I mean, one would think you wouldn’t need to be shot to learn that but I guess remedial karma is in session. Nope, thats been dead for probably a long time. In NYC if you have enough money and influence to get a legal gun then you probably have enough money and influence to get out of anything, such as shooting someone in the middle of 5th Avenue. Knife? That’s not a knife. THIS is a knife. Alabama has a use of firearm to prevent a felony statute. This happened about 8 miles from me – don’t know the players although I did get to sit beside the police chief during a recent jury selection. 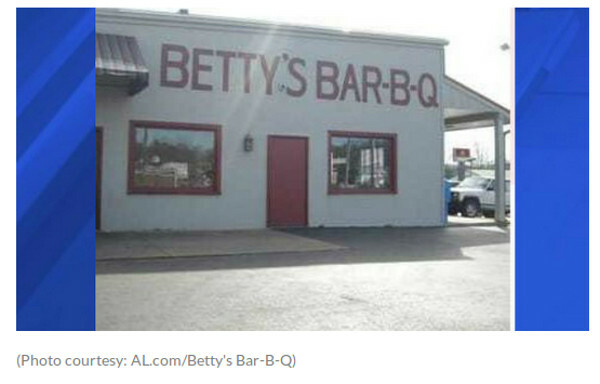 Interestingly enough, the area (especially beside/behind Betty’s) would be conducive to shooting with a smaller-than-average chance of collateral damage, so there’s that. Also, given the usual societal issues and crime statistics, I found it notable (at least to me, take that however you want) that the bullet-catcher was caucasian! Guess at the very least we won’t be inundated with the BLM crowd. Take aways: Play stupid games, win stupid prizes! They’re pretty much OK with guns around there. And what a treat to visit– basically a country club for shooters, complete with golf carts for hauling your gear. If TTAG hasn’t run an article about it– they probably should. Also, I have been to the CMP myself for a M1 Master Class and I remember driving by the place in the photo. Bunch of nice and helpful folks in the area even though I am a CT Yankee everyone was nice and I had fun chatting with everyone I met. I’d argue that the moment you use the threat of deadly force you’re fair game in most situations. Obviously the situation can dictate reaction….if there’s a crowd or collateral behind obviously you need to be smart…but there’s no guarantee that person doesn’t come back, threaten someone else, return fire, etc. Based upon some of the officer related shootings recently, I’d certainly say it’d be hard to blame a citizen for thinking someone who robbed them running around with a gun is a deadly threat. This wouldn’t be a discussion in any part of Europe. If you shoot an attacker, you go to prison. It doesn’t matter if the suspect has stuck a knife in your chest and is squeezing your neck while you shoot him. That’s why I prefer living here in the good old, “mean”, “gun-crazy” (according to euros) USA. Know the kid well. KARMA! It was just a matter of time. By the way, he has GREAT parents.